Actually it’s an incredible book, so many things you can learn from the Bible and you can lead your life. I’m not just talking in terms of religion; I’m talking in terms of leading a life even beyond religion. There are so many brilliant things in the Bible. The Bible, is special, the Bible the more you see it, the more you read it, the more incredible it is. I don’t like to use this analogy, but like a great movie, a great, incredible movie. You’ll see it once it will be good. You’ll see it again. You can see it 20 times and every time you’ll appreciate it more. The Bible is the most special thing. 10. Ephesians 5:3-4 Let there be no sexual immorality, impurity, or greed among you. Such sins have no place among God’s people. Obscene stories, foolish talk, and coarse jokes—these are not for you. 9. Colossians 4:6 Let your conversation be gracious and attractive so that you will have the right response for everyone. 8. Titus 3:2 [Leaders] must not slander anyone and must avoid quarreling. Instead, they should be gentle and show true humility to everyone. 7. James 3:13 If you are wise and understand God’s ways, prove it by living an honorable life, doing good works with the humility that comes from wisdom. 6. Romans 12:18 Do all that you can to live in peace with everyone. 3. Romans 12:21 Don’t let evil conquer you, but conquer evil by doing good. If you are one of many evangelicals supporting Donald Trump, I’m not judging you, either. 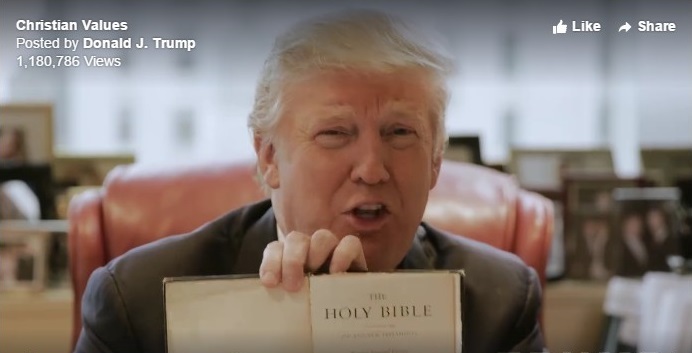 I am simply urging you to honestly ask, Is Donald Trump supporting biblical teachings? Please “be as shrewd as snakes and harmless as doves” (Matthew 10:16) as you select the next president of the United States.